Editors: Christenson, Sandra L. and Reschly, Amy L.
Family-school partnerships are increasingly touted as a means of improving both student and school improvement. This recognition has led to an increase in policies and initiatives that offer the following benefits: improved communication between parents and educators; home and school goals that are mutually supportive and shared; better understanding of the complexities impinging on children's development; and pooling of family and school resources to find and implement solutions to shared goals. This is the first comprehensive review of what is known about the effects of home-school partnerships on student and school achievement. 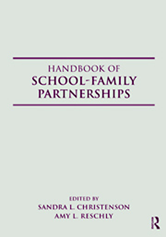 It provides a brief history of home-school partnerships, presents evidence-based practices for working with families across developmental stages, and provides an agenda for future research and policy.